Hey gang! As I mentioned, the ballot for this year’s community best-of awards is being broken up into three pieces so as for everything to be a little more manageable. Before you begin, take a few minutes to consider these various things, if you haven’t already. If you have already, fyi, a few details were changed a little bit to make things better; nothing substantive, just logistics around the prize process. I think it’s safe to say that we had a ton of surprises this year. 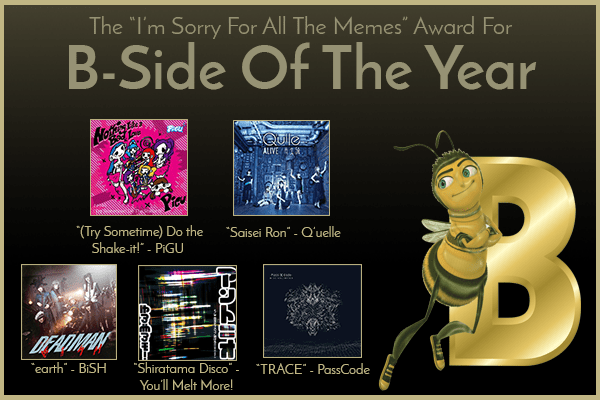 Your nominees wound up being NECRONOMIDOL’s unleashing from chaos born very shortly after Album of the Year candidate NEMESIS; The World Standard going heavy for “The Perfect Idol”; BiS being brought back from the actual dead; Hauptharmonie capping a great year by adding not just new members, but the Idol Formerly Known as Mone with that; promo idols DEEP GIRL blasting open 2016 with “I kill”; and, the most recent, Zenbu Kimi no Sei Da embroiled in a membership scandal. Idols do collaborations all the time, with other idols and bands and so on. The results can be pretty great, as these nominees demonstrate. There were a lot of great debuts in 2016; this category covers the first (or, at least, intended) physical release of newcomers. We saw the birth of demon clowns Bokura no Oyugi and sister groups for Zenkimi, PassCode, Bellring Girls Heart and (briefly!) BiS in the form of Yukueshirezutsurezure, NEVE SLIDE DOWN, Yanakoto Sotto Mute and SiS, respectively. Whose was the best? Idols and singles go together like eggs and bacon. The title tracks tend to get the most hype, but there are a lot of hidden gems among the B-sides. Which song here makes the best impression on you? *Vote for the video, please, not the song. We don’t need our own version of the Gold Glove awards. The World Standard have “The Perfect Idol” up for Surprise of the Year twice. Which, is, admittedly, pretty surprising. Yeah, I was trying to respond to Chris’s note earlier when I was at the doctor’s office, doing it on my phone, and it looks like “doing it on my phone” only works when you actually finish the process of updating your forms. Fixed now! I’m mad at you for making me choose! The Ano/Seiko vs. Nozomi/Friends decision is not one I took lightly! It almost boiled down to whichever one I listened to most recently, but I had to give it to Nozomi for bringing Mitchel out of retirement. Both of those tracks are so fantastic, though. Holy moly they are fantastic. I also wonder if I might have picked Neve Slide Down over Tsurezure if I’d just listened to more Neve Slide Down. Touch choices! Well, I have entered my votes. No crap. It pains me that I couldn’t vote for all three of these. Same! I was torn between Hamidashi PARADISE, Barebare I Love You or ROOM 24-7. So many great MVs this year! It tried to choose between NECRONOMIDOL — “Skulls in the Stars”, DEEP GIRL — “I kill” and BiSH — “Hontou Honki”. Everything was pretty easy for me since I was already set on my choices. The only one I had to really think on was Debut Of The Year which came down to two choices. I love Tsurezure but it was aesthetic, atmosphere, overall sonics, and vocals that helped with my decision on Yanakoto Sotto Mute.